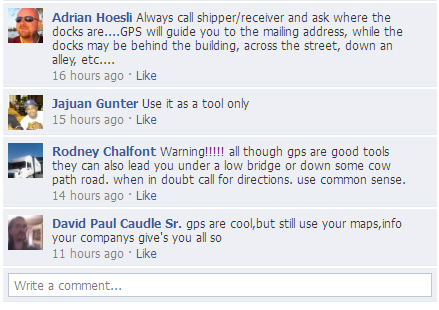 Anyone that has used any type of GPS for directions knows it's not always a perfect process. While many advances have been made to the GPS technology and with proper updates to your device it may be remarkably accurate, there are still going to be times when it isn't available or isn't perfect. It's times like these when your refined map reading skills you learned during CDL training need to kick in. One of the most important parts of working a truck driving job (or any other job for that matter) is being reliable. And part of being reliable is being on time. Having incorrect directions for your destination can certainly making being on time more difficult. We asked those truck drivers that are fans of the Driver Solutions Facebook page to provide some tips for new drivers just getting started with CDL training on using a GPS as a truck driver. Do you have any other tips for using a GPS to add to this list? Share in the comments section below or on the Driver Solutions Facebook Page.